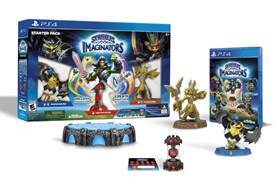 · Skylanders Imaginators Portal Owners Pack at $25, available at Wal-Mart – the perfect gift idea for the Portal Master who already has portals from previous Skylanders games -- Skylanders SuperChargers, Skylanders Trap Team, Skylanders SWAP Force or Skylanders Giants. o The Portal Owners Pack will be available exclusively to Wal-Mart shoppers for a limited time during the retailer’s Black Friday event which starts at 6 p.m. local time on Thanksgiving, November 24 (price valid through Friday). · Meet Jingle Bell Chompy Mage (on sale at major retailers on 11/25): Love This!! Jingle Bell Chompy Mage is a specially designed toy that appears in the game outfitted in a holiday-inspired wardrobe. He joins the lineup of Sensei Skylanders new to Skylanders Imaginators and is ready to teach the Skylanders some new fighting techniques and a classic Chompy holiday tradition – the White Chompy gift exchange! • Tune in! Watch Eruptor take to the sky during the 90th Macy’s Thanksgiving Day Parade! This marks Eruptor’s third flight above New York City, where he will be flashing his 25-foot smile to thousands of onlookers and fans at home. Be sure to tune in to NBC on November 24th at 9AM (all time zones).